Yamhad was an ancient Semitic kingdom centered on Ḥalab (Aleppo), Syria. The kingdom emerged at the end of the 19th century BC, and was ruled by the Yamhadite dynasty kings, who counted on both military and diplomacy to expand their realm. From the beginning of its establishment, the kingdom withstood the aggressions of its neighbors Mari, Qatna and Assyria, and was turned into the most powerful Syrian kingdom of its era through the actions of its king Yarim-Lim I. By the middle of the 18th century BC, most of Syria minus the south came under the authority of Yamhad, either as a direct possession or through vassalage, and for nearly a century and a half, Yamhad dominated northern, northwestern and eastern Syria, and had influence over small kingdoms in Mesopotamia at the borders of Elam. The kingdom was eventually destroyed by the Hittites, then annexed by Mitanni in the 16th century BC. Yamhad's population was predominately Amorite, and had a typical Bronze Age Syrian culture. Yamhad was also inhabited by a substantial Hurrian population that settled in the kingdom, adding the influence of their culture. Yamhad controlled a wide trading network, being a gateway between the eastern Iranian plateau and the Aegean region in the west. Yamhad worshiped the traditional Northwest Semitic deities, and the capital Halab was considered a holy city among the other Syrian cities as a center of worship for Hadad, who was regarded as the main deity of northern Syria. Little of Halab has been excavated by archaeologists, as Halab was never abandoned during its long history and the modern city is situated above the ancient site. Therefore, most of the knowledge about Yamhad comes from tablets discovered at Alalakh and Mari. The name Yamhad was likely an Amorite tribal name and is used synonymously with Halab when referring to the kingdom. The city of Halab was a religious center in northern Syria, and was mentioned by the name Ha-lam, as a vassal of the Eblaite empire, which controlled most of Syria in the middle of the third millennium BC. Halab's fame as a Holy City contributed to its later prominence; the main temple of the north Syrian storm god Hadad was located in the city, which was known as the "City of Hadad". The name Halab as well as that of Yamhad appeared for the first time during the Old Babylonian period, when Sumu-Epuh, the first Yamhadite king, was attested in a seal from Mari as the ruler of the land of Yamhad, which included, in addition to Halab, the cities of Alalakh and Tuba. Sumu-Epuh consolidated the kingdom and faced Yahdun-Lim of Mari who had a dynastic alliance with Yamhad to oppose Assyria, but eventually campaigned in the north threatening the kingdom. The Yamhadite king supported the Yaminite tribes and formed an alliance with other Syrian states including Urshu, Hassum and Carchemish, against the Mariote king who defeated his enemies, but was eventually killed by his son Sumu-Yamam. Legal case from Niqmi-Epuh of Yamhad, to the king of Alalakh. The rise of Shamshi-Adad I of Assyria proved more dangerous to Yamhad than Mari. The Assyrian king was an ambitious conqueror with the aim to rule Mesopotamia and the Levant, and styled himself as "king of the world". Shamshi-Adad surrounded Yamhad by way of alliances with Charchemish, Hassum and Urshu to the north and by conquering Mari to the east, forcing Zimri-Lim the heir of Mari to flee. Sumu-Epuh welcomed Zimri-Lim and aimed to use him against Assyria since he was the legitimate heir of Mari. Shamshi-Adad's most dangerous alliance was with Qatna, whose king Ishi-Addu became Assyria's agent at Yamhad's borders and married his daughter to Yasmah-Adad, the son of the Assyrian king who was installed by his father as king of Mari. Sumu-Epuh was apparently killed during his fight with Shamshi-Adad and was succeeded by his son Yarim-Lim I, who consolidated his father's kingdom and turned it into the most powerful kingdom in Syria and northern Mesopotamia. Yarim-Lim surrounded Shamshi-Adad by alliances with Hammurabi of Babylon and Ibal-pi-el II of Eshnunna, then in 1777 BC he advanced to the east conquering Tuttul and installing Zimri-Lim as governor of the city. The death of the Assyrian king came a year later. Yarim-Lim then sent his army with Zimri-Lim, to restore his ancestors throne as an ally-vassal to Yamhad, cementing the relationship through a dynastic marriage between the new Mariote king and Shibtu, the daughter of Yarim-Lim. "There is no king who is mighty by himself. Ten or fifteen kings follow Hammurabi the ruler of Babylon, a like number of Rim-Sin of Larsa, a like number of Ibal-pi-el of Eshnunna, a like number of Amud-pi-el of Qatanum, but twenty follow Yarim-Lim of Yamhad." A tablet sent to Zimri-Lim of Mari, describing Yarim-Lim I authority. Yarim-Lim spent the next years of his reign expanding the kingdom, which reached Mamma in the north. The Syrian city-states were subdued through alliances or force; Mamma, Ebla and Ugarit became vassals of Yamhad, while Qatna remained independent but came to peace with Yamhad following the death of its ally, the late Shamshi-Adad I. A sample of Yarim-Lim policy of diplomacy and war can be read in a tablet discovered at Mari, that was sent to the king of Dēr in southern Mesopotamia, which included a declaration of war against Der and its neighbor Diniktum, the tablet mentions the stationing of 500 Yamhadite warships for twelve years in Diniktum, and the Yamhadite military support of Der for 15 years. Yarim-Lim's accomplishments elevated Yamhad into the status of a Great Kingdom and the Yamhadite king title became the Great King. Yarim-Lim I was succeeded by his son Hammurabi I who had a peaceful reign. He was able to force Charchemish into submission, and sent troops to aid Hammurabi of Babylon against Larsa and Elam. The alliance ended after the Babylonian king sacked Mari and destroyed it. Babylon did not attack Yamhad, however, and the relations between the two kingdoms remained peaceful in later years; the power vacuum caused by Mari's fall opened the way for Hammurabi to extend Yamhad's hegemony over the upper Khabur valley in the east, where the ruler of Shubat Enlil became his vassal. Hammurabi I was succeeded by his son Abba-El I, whose reign witnessed the rebellion of the city Irridu, which was under the authority of prince Yarim-Lim, Abba-El's brother. The king responded to the rebellion by destroying Irridu, and compensating his brother by giving him the throne of Alalakh, thus creating a cadet branch of the dynasty. God head, discovered near Jabbul (c. 1600 BC). The era of Abba-El I's successors is poorly documented, and by the time of Yarim-Lim III in the mid-17th century BC, the power of Yamhad declined due to internal dissent. Yarim-Lim III ruled a weakened kingdom, and although he imposed Yamhadite hegemony over Qatna, the weakening was obvious as Alalakh had become all but independent under the self-declared king Ammitakum. In spite of this regression, the king of Yamhad remained the strongest king of the Syrian states, as he was referred to as a Great King by the Hittites, the diplomatic equal of the Hittite king. The rise of the Hittite kingdom in the north posed the biggest threat to Yamhad, although Yarim-Lim III and his successor Hammurabi III were able to withstand the aggressions of the Hittite king Hattusili I through alliances with the Hurrian principalities. Hattusili chose not to attack Halab directly and began with conquering Yamhad's vassals and allies, starting with Alalakh in the second year of his Syrian campaigns c. 1650 BC (Middle chronology) or slightly later. Hattusili then turned to attack the Hurrians in Urshu northeast of Halab, and won in spite of military support from Halab and Carchemish for the Hurrians. The Hittite king then defeated Yamhad in the battle of Mount Atalur, and sacked Hassum along with several other Hurrian cities in the sixth year of his Syrian wars. After many campaigns, Hattusili I finally attacked Halab during the reign of Hammurabi III. The attack ended in a defeat, the wounding of the Hittite king and his later death c. 1620 BC. Hattusili's campaigns considerably weakened Yamhad, causing it to decline in status: the monarch ceased to be styled a Great King. Hattusili was succeeded by his grandson Mursili I, who conquered Halab c. 1600 BC and destroyed Yamhad as a major power in the Levant. Mursili then left for Babylon and sacked it, but was assassinated upon his return to his capital Hattusa, and his empire disintegrated. Halab was rebuilt and the kingdom expanded to include Alalakh again. The reestablished kingdom was ruled by kings of whom nothing but their names is known; the first is Sarra-El, who might have been the son of Yarim-Lim III. The last king of the dynasty to rule as king of Halab was Ilim-Ilimma I, whose reign ended c. 1524 when he was killed during a rebellion orchestrated by king Parshatatar of Mitanni who annexed Halab. Ilim-Ilimma's son, Idrimi, fled to Emar then conquered Alalakh c. 1517 BC. Seven years following his conquest of Alalakh, Idrimi made peace with Mitanni and was acknowledged as a vassal, and allowed to control Halab, though he had to relocate the dynasty's residence to Alalakh and relinquish the title of "King of Halab"; the use of the name Yamhad also ended. Dates are estimated and given by the Middle chronology. Yarim-Lim I c. 1780 BC – c. 1764 BC Great King Son. Hammurabi I c. 1764 BC – c. 1750 BC Great King Son. Abba-El I c. 1750 BC – c. 1720 BC Great King Son. Yarim-Lim II c. 1720 BC – c. 1700 BC Great King Son. Niqmi-Epuh c. 1700 BC – c. 1675 BC Great King Son. Irkabtum c. 1675 BC – Mid-17th century BC Great King Son. Hammurabi II Mid-17th century BC Great King Possible brother. Yarim-Lim III Mid-17th century BC – c. 1625 BC Great King Brother of Irkabtum. Hammurabi III c. 1625 BC – c. 1600 BC King Son. Sarra-El Early 16th century BC King Possible son of Yarim-Lim III. Abba-El II Mid-16th century BC King Son. Ilim-Ilimma I c. 1524 – c. 1517 BC King Possible son. Seal of Abba-El II: the Egyptian ankh was a replacement for the cup usually held by the deity. The people of Yamhad were Amorites and spoke the Amorite language, and apart from a few Mesopotamian, Egyptian and Aegean influences, Yamhad belonged mainly to middle Bronze Age Syrian culture. This culture influenced the architecture and the functions of the temples, which were mainly cultic, while political authority was invested in the royal palace, in contrast to the important political role of the temples in Mesopotamia. Since the capital Halab has not been excavated, the architecture of the kingdom is archaeologically best represented by the city of Alalakh, which was subordinate to Halab and ruled by a king belonging to the Yamhadite royal house. The Amorites in general built large palaces that bear architectural similarities to old Baylonian-era palaces. They were adorned with grand central courtyards, throne rooms, tiled floors, drainage systems and plastered walls, which suggest the employment of specialized labor. Evidence exists for the presence of Minoan Aegean fresco artists who painted elaborate scenes on the walls of the palaces in Alalakh. Yamhad had a distinctive Syrian iconography, which is clear in the seals of the kings that gave prominence to the Syrian gods. Egyptian influence was minimal and limited to the ankh, which cannot be interpreted as an emulation of Egyptian rituals but rather as merely a substitute for the cup held by the deity elsewhere. Yamhad had a special pattern of trim called the Yamhad style, which was favored in Mari during the reign of king Zimri-Lim, whose queen Shibtu was the daughter of Yarim-Lim I. After the fall of the Akkadian Empire, Hurrians began to settle in the city and its surroundings, and by c. 1725 BC they constituted a sizable portion of the population. The presence of a large Hurrian population brought Hurrian culture and religion to Halab, as evidenced by the existence of certain religious festivals that bear Hurrian names. Halab's location has always been a factor in its prominence as an economic center. Yamhad's economy was based on trade with the Iranian Plateau, Mesopotamia, Cyprus and Anatolia, with the city of Emar as its port on the Euphrates, and Alalakh with its proximity to the sea as its port on the Mediterranean. The actions of Yarim-Lim I and his alliance with Babylon proved vital for the kingdom's economy, for they secured the trade between Mesopotamia and northern Syria, with the king of Mari protecting the caravans crossing from the Persian Gulf to Anatolia. 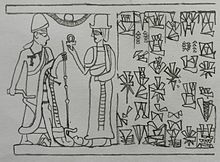 Emar attracted many Babylonian merchants, who lived in the city and had a lasting impact on the local scribal conventions. As late as the 14th century BC, texts of the so-called Syrian type from Emar preserve distinct Babylonian traits. The markets of Yamhad became a source of copper, which was imported from the mountains (probably Anatolian) and Cyprus. However, the Babylonian invasion of Mari had a negative impact on the trade between the two kingdoms, as the road became dangerous because of the loss of Mari's protection to the caravans. This led the Babylonian king Samsu-iluna to build many strongholds up the river valley, and to establish colonies of mercenaries known as the "Kassite Houses" to protect the middle Euphrates area. Those colonies later evolved into semi-independent polities that waged a war against the Babylonian king Ammi-Saduqa and caused the trade temporarily to stop. The people of Yamhad practiced the Amorite religion, and mainly worshiped the Northwest Semitic deities. The most important of these were Dagon, who was considered the father of the gods, and Hadad, who was the most important deity and the head of the pantheon. The kingdom was known as the "land of Hadad", who was famous as the Storm-God of Halab beginning in the middle of the 3rd millennium BC. His main temple was located on the citadel hill in the center of the city and remained in use from the 24th century BC, until at least the 9th century BC. The title "Beloved of Hadad" was one of the king's titles. Hadad was the kingdom's patron god, and all treaties were concluded in his name, which was also used to threaten other kingdoms, and to declare wars. As the Hurrian presence grew, so did Hurrian religious influences and some of the Hurrian deities found a place in the Yamhadite pantheon. King Abba-El I mentioned receiving the support of the Hurrian goddess Hebat in one of the Alalakh tablets (Hebat was the spouse of the Hurrian main deity Teshub, but in Abba-El I's tablet, she is associated with Hadad). Later, the Hurrians started to identify Teshub with Hadad, who became Teshub the Storm-God of Halab. Beside the general gods, the kings had a "head god", that is, a deity who had an intimate connection for the worshiper. King Yarim-Lim I described Hadad as the god of the state, but the Mesopotamian deity Sin as the god of his head. His son Hammurabi I did likewise. ^ a b c Dalley 2002, p. 44. ^ a b c d e Astour 1981, p. 7. ^ Hamblin 2006, p. 257. ^ Pioske 2015, p. 188. ^ Grabbe 2007, p. 58. ^ a b Hawkins 2000, p. 388. ^ Pfälzner 2012, p. 781. ^ Archi 1994, p. 250. ^ Hamblin 2006, p. 242. ^ a b Feliu 2003, p. 192. ^ Oldenburg 1969, p. 65. ^ Bryce 2014, p. 111. ^ Frayne 1990, p. 780. ^ a b Miller 1995, p. 10. ^ Schwartz 2010, p. 376. ^ Liverani 2013, p. 225, 226. ^ Wossink 2009, p. 128. ^ Sasson 1969, p. 45. ^ Wu 1994, p. 131. ^ Frayne 1990, p. 606. ^ a b Pitard 2001, p. 39. ^ Schwartz 2013, p. 9. ^ a b c d e f g Liverani 2013, p. 234. ^ Bryce 2009, p. 773. ^ Matthiae 2003, p. 383. ^ a b Pitard 2001, p. 40. ^ a b c d e f Hamblin 2006, p. 259. ^ Charpin 2011, p. 257. ^ Dodd 2007, p. 210. ^ Thuesen 2000, p. 61. ^ a b Sasson 1969, p. 2. ^ Charpin 2010, p. 102. ^ Lauinger 2015, p. 6. ^ a b c d e Hamblin 2006, p. 260. ^ a b Wiseman 1967, p. 121. ^ Miller 1995, p. 12. ^ a b Hamblin 2006, p. 258. ^ Bryce 2014, p. 27. ^ a b Liverani 2013, p. 260. ^ Collon 1995, p. 97. ^ Hamblin 2006, p. 298, 299. ^ Bryce 1999, p. 83. ^ Bryce 2014, p. 29. ^ Burney 2004, p. 107. ^ Bryce 1999, p. 152. ^ Hamblin 2006, p. 260. ^ Payne 2012, p. 3. ^ Bryce 1999, p. 126. ^ a b c Astour 1969, p. 382. ^ Drower 1973, p. 433. ^ a b Collon 1995, p. 109. ^ a b Astour 1989, p. 92. ^ Podany 2010, p. 136. ^ Astour 1981, p. 9. ^ Frayne 1990, p. 783. ^ Teissier 1996, p. 28. ^ Frayne 1990, p. 788. ^ Frayne 1990, p. 792. ^ Teissier 1996, p. 26. ^ van Soldt 2000, p. 106. ^ Frayne 1990, p. 795. ^ van Soldt 2000, p. 107. ^ Astour 1989, p. 19. ^ Schwartz 2013, p. 3. ^ Schwartz 2013, p. 10. ^ a b Liverani 2013, p. 232. ^ Feldman 2007, p. 55. ^ van Soldt 2000, p. 109. ^ a b Burke 2013, p. 409. ^ Teissier 1996, p. 38. ^ Dalley 2002, p. 51. ^ Owen 2000, p. 618. ^ Nathanson 2013, p. 72. ^ a b c Kupper 1973, p. 41. ^ Zohar 2013, p. 95. ^ Sicker 2003, p. 32. ^ Pruzsinszky 2007, p. 23. ^ a b c d e f van Koppen 2010, p. 212. ^ van Koppen 2010, p. 213. ^ Foster 2009, p. 148. ^ Fleming 2000, p. 90. ^ a b c Taracha 2009, p. 121. ^ Gonnella 2006, p. 166. ^ Gonnella 2010, p. 114. ^ Oldenburg 1969, p. 67. ^ Oldenburg 1969, p. 160. ^ Green 2003, p. 181. ^ Green 2003, p. 170. ^ van der Toorn 1996, p. 77, 88. Archi, Alfonso (1994). "Studies in the Pantheon of Ebla". Orientalia. Pontificium Institutum Biblicum. 63 (3). OCLC 557711946. Astour, Michael.C (1969). "The Partition of the Confederacy of Mukiš-Nuḫiašše-Nii by Šuppiluliuma: A Study in Political Geography of the Amarna Age". Orientalia. 38. Pontificium Institutum Biblicum. OCLC 557711946. Astour, Michael C. (1989). Hittite History and Absolute Chronology of the Bronze Age. Studies in Mediterranean Archaeology and Literature. 73. Astroms Forlag. ISBN 978-91-86098-86-5. Bryce, Trevor (1999) . The Kingdom of the Hittites. Oxford University Press. ISBN 978-0-19-924010-4. Bryce, Trevor (2009). The Routledge Handbook of the Peoples and Places of Ancient Western Asia. Routledge. ISBN 978-1-134-15908-6. Burke, Aaron A. (2013). "Introduction to the Levant During the Middle Bronze Age". In Steiner, Margreet L.; Killebrew, Ann E. (eds.). The Oxford Handbook of the Archaeology of the Levant: c. 8000-332 BCE. Oxford University Press. ISBN 978-0-19-166255-3. Burney, Charles (2004). Historical Dictionary of the Hittites. Historical Dictionaries of Ancient Civilizations and Historical Eras. 14. Scarecrow Press. ISBN 978-0-8108-6564-8. Charpin, Dominique (2010). Writing, Law, and Kingship in Old Babylonian Mesopotamia. Translated by Todd, Jean Marie. University of Chicago Press. ISBN 978-0-226-10159-0. Charpin, Dominique (2011). "Patron and Client: Zimri-Lim and Asqudum the Diviner". In Radner, Karen; Robson, Eleanor (eds.). The Oxford Handbook of Cuneiform Culture. Oxford University Press. ISBN 978-0-19-955730-1. Claire, Iselin (2017). "Head of a God". Louvre. Retrieved January 1, 2017. Collon, Dominique (1995). Ancient Near Eastern Art. University of California Press. ISBN 978-0-520-20307-5. Dalley, Stephanie (2002) . Mari and Karana, Two Old Babylonian Cities (2 ed.). Gorgias Press. ISBN 978-1-931956-02-4. Dodd, Lynn Swartz (2007). "Strategies for Future Success: Remembering the Hittites during the Iron Age". Anatolian Studies. Cambridge University Press on Behalf of the British Institute of Archaeology at Ankara. 57. doi:10.1017/s0066154600008619. ISSN 0066-1546. Drower, Margaret S. (1973). "Syria c. 1550–1400 B.C.". In Edwards, Iorwerth Eiddon Stephen; Gadd, Cyril John; Hammond, Nicholas Geoffrey Lemprière; Sollberger, Edmond (eds.). Part 1: The Middle East and the Aegean Region, c.1800–1380 BC. The Cambridge Ancient History (Second Revised Series). 2 (3 ed.). Cambridge University Press. ISBN 978-1-139-05426-3. Feldman, Marian H. (2007). "Frescoes, Exotica, and the Reinvention of the Northern Levantine Kingdoms during the Second Millenium B.C.E". In Heinz, Marlies; Feldman, Marian H. (eds.). Representations of Political Power: Case Histories from Times of Change and Dissolving Order in the Ancient Near East. Eisenbrauns. ISBN 978-1-57506-135-1. Feliu, Lluís (2003). The God Dagan in Bronze Age Syria. Translated by Watson, Wilfred GE. Brill. ISBN 978-90-04-13158-3. Fleming, Daniel E. (2000). Time at Emar: The Cultic Calendar and the Rituals from the Diviner's Archive. Mesopotamian Civilizations. 11. Eisenbrauns. ISBN 978-1-57506-044-6. Frayne, Douglas (1990). Old Babylonian Period (2003–1595 BC). The Royal Inscriptions of Mesopotamia Early Periods. 4. University of Toronto Press. ISBN 978-0-8020-5873-7. Gonnella, Julia (2006). "The Citadel of Aleppo: Recent Studies". In Kennedy, Hugh N. (ed.). Muslim Military Architecture in Greater Syria: From the Coming of Islam to the Ottoman Period. History of Warfare. 35. Brill. ISBN 978-90-04-14713-3. ISSN 1385-7827. Gonnella, Julia (2010). "Columns and Hieroglyphs: Magic Spolia in Medieval Islamic Architecture of Northern Syria". In Necipoğlu, Gülru; Leal, Karen A. (eds.). Muqarnas: An Annual on the Visual Cultures of the Islamic World. 27. Brill. ISBN 978-90-04-18511-1. ISSN 0732-2992. Grabbe, Lester L. (2007). Ancient Israel: What Do We Know and How Do We Know It?. T&T Clark. ISBN 978-0-567-03254-6. Green, Alberto Ravinell Whitney (2003). The Storm-god in the Ancient Near East. Biblical and Judaic studies from the University of California, San Diego. 8. Eisenbrauns. ISBN 978-1-57506-069-9. Hamblin, William J. (2006). Warfare in the Ancient Near East to 1600 BC. Routledge. ISBN 978-1-134-52062-6. Hawkins, John David (2000). Corpus of Hieroglyphic Luwian Inscriptions. Vol 1 Inscriptions of the Iron Age. Untersuchungen Zur Indogermanischen Sprach- und Kulturwissenschaft. Neue Folge / Studies in Indo-European Language and Culture. New Series. 8.1. Walter de Gruyter. ISBN 978-3-11-080420-1. Kupper, Jean Robert (1973). "Northern Mesopotamia and Syria". In Edwards, Iorwerth Eiddon Stephen; Gadd, Cyril John; Hammond, Nicholas Geoffrey Lemprière; Sollberger, Edmond (eds.). Part 1: The Middle East and the Aegean Region, c.1800–1380 BC. The Cambridge Ancient History (Second Revised Series). 2 (3 ed.). Cambridge University Press. ISBN 978-1-139-05426-3. Lauinger, Jacob (2015). Following the Man of Yamhad: Settlement and Territory at Old Babylonian Alalah. Brill. ISBN 978-90-04-29289-5. Liverani, Mario (2013). The Ancient Near East: History, Society and Economy. Routledge. ISBN 978-1-134-75084-9. Matthiae, Paolo (2003). "Ishtar of Ebla and Head of Aleppo: Notes on Terminology, Politics and Religion of Old Syrian Ebla". In Marrassini, Paolo (ed.). Semitic and Assyriological Studies: Presented to Pelio Fronzaroli by Pupils and Colleagues. Otto Harrassowitz Verlag. ISBN 978-3-447-04749-4. Miller, Julie A. (1995). "Alalakh". In Ring, Trudy; Salkin, Robert M.; La Boda, Sharon (eds.). International Dictionary of Historic Places. 3 (Southern Europe). Fitzroy Dearborn Publishers. ISBN 978-1-884964-02-2. Nathanson, Michael (2013). Between Myth & Mandate: Geopolitics, Pseudohistory & the Hebrew Bible. Author House. ISBN 978-1-4918-2310-1. Owen, David I. (2000). "Hurrians". In Freedman, David Noel; Myers, Allen C. (eds.). Eerdmans Dictionary of the Bible. Eerdmans Publishing. ISBN 978-90-5356-503-2. Payne, Annick (2012). Iron Age Hieroglyphic Luwian Inscriptions. Writings from the Ancient World. 29. Society of Biblical Literature. ISBN 978-1-58983-658-7. Pioske, Daniel D. (2015). David's Jerusalem: Between Memory and History. Routledge Studies in Religion. 45. Routledge. ISBN 978-1-317-54891-1. Pruzsinszky, Regine (2007). "Emar and the Transition from Hurrian to Hittite Power". In Heinz, Marlies; Feldman, Marian H. (eds.). Representations of Political Power: Case Histories from Times of Change and Dissolving Order in the Ancient Near East. Eisenbrauns. ISBN 978-1-57506-135-1. Sasson, Jack M. (1969). The Military Establishments at Mari. Studia Pohl. 3: Dissertationes Scientificae de Rebus Orientis Antiqui. Pontifical Biblical Institute. OCLC 32801. Schwartz, Glenn M. (2010). "Early Non-cuneiform Writing? Third-millennium BC Clay Cylinders from Umm el-Marra". In Melville, Sarah C.; Alice L., Slotsky (eds.). Opening the Tablet Box: Near Eastern Studies in Honor of Benjamin R. Foster. Culture and History of the Ancient Near East. 42. Brill. ISBN 978-90-04-18652-1. ISSN 1566-2055. Schwartz, Glenn M. (2013). "An Amorite Global Village: Syrian-Mesopotamian Relations in the Second Millennium B.C". In Aruz, Joan; Graff, Sarah B.; Rakic, Yelena (eds.). Cultures in Contact: From Mesopotamia to the Mediterranean in the Second Millennium B.C. Metropolitan Museum of Art. ISBN 978-1-58839-475-0. Sicker, Martin (2003). The Rise and Fall of the Ancient Israelite States. Praeger Publishers. ISBN 978-0-275-98012-2. Taracha, Piotr (2009). Religions of Second Millennium Anatolia. Dresdner Beiträge zur Hethitologie. 27. Otto Harrassowitz Verlag. ISBN 978-3-447-05885-8. ISSN 1619-0874. Teissier, Beatrice (1996) . Egyptian Iconography on Syro-Palestinian Cylinder Seals of the Middle Bronze Age. Orbis Biblicus et Orientalis- Series Archaeologica. 11. University Press Fribourg Switzerland. ISBN 978-3-525-53892-0. ISSN 1422-4399. Thuesen, Ingolf (2000). "The City-State in Ancient Western Syria". In Hansen, Mogens Herman (ed.). A Comparative Study of Thirty City-state Cultures: An Investigation. 21. Kgl. Danske Videnskabernes Selskab. ISBN 978-87-7876-177-4.
van der Toorn, Karel (1996). Family Religion in Babylonia, Ugarit and Israel: Continuity and Changes in the Forms of Religious Life. Studies in the History of the Ancient Near East. 7. Brill. ISBN 978-90-04-10410-5. ISSN 0169-9024.
van Koppen, Frans (2010) . "Aspects of Society and Economy in the later Old Babylonian Period". In Leick, Gwendolyn (ed.). The Babylonian World. Routledge. ISBN 978-1-134-26128-4.
van Soldt, Wilfred (2000). "Syrian Chronology in the Old and Early Middle Babylonian Period". Akkadica. Assyriological Center Georges Dossin. 119. ISSN 1378-5087. Wiseman, Donald John (1967). "Alalakh". In Thomas, David Winton (ed.). Archaeology and Old Testament study: jubilee volume of the Society for Old Testament Study, 1917–1967. Clarendon Press. OCLC 366758. Wossink, Arne (2009). Challenging Climate Change: Competition and Cooperation Among Pastoralists and Agriculturalists in Northern Mesopotamia (c. 3000–1600 BC). Sidestone Press. ISBN 978-90-8890-031-0. Wu, Yuhong (1994). A Political History of Eshnunna, Mari and Assyria during the Early Old Babylonian Period (from the End of Ur III to the Death of Šamši-Adad). Institute of History of Ancient Civilizations. OCLC 69135570. Zohar, Zvi (2013). Rabbinic Creativity in the Modern Middle East. Kogod library of Judaic Studies. 11. Bloomsbury. ISBN 978-1-4411-3329-8. Wikimedia Commons has media related to Yamhad. 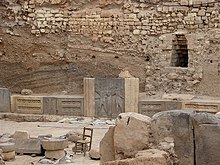 Hadad temple discovery. Kay Kohlmeyer, an archaeologist at Berlin's University of Applied Sciences and the excavation co-director explain about the temple. Mari was an ancient Semitic city in modern-day Syria. Its remains constitute a tell located 11 kilometers north-west of Abu Kamal on the Euphrates river western bank, some 120 kilometers southeast of Deir ez-Zor. It flourished as a trade center and hegemonic state between 2900 BC and 1759 BC. As a purposely-built city, the existence of Mari was related to its position in the middle of the Euphrates trade routes; this position made it an intermediary between Sumer in the south and the Levant in the west. Zimri-Lim was king of Mari from about 1775 to 1761 BC. Abba-El I was the king of Yamhad (Halab), succeeding his father Hammurabi I.
Abba-El II was the king of Halab who reigned after the withdrawal of the Hittites. Yarim-Lim was a king of Alalakh and son of Hammurabi I of Yamhad. He was granted the city of Alalakh by his brother Abba-El I of Yamhad and started a cadet branch of the Yamhadite dynasty that lasted until the conquest of Alalakh by the Hittite king Hattusili I. The Yamhad dynasty was an ancient Amorite royal family founded in c. 1810 BC by Sumu-Epuh of Yamhad who had his capital in the city of Aleppo. Started as a local dynasty, the family expanded its influence through the actions of its energetic ruler Yarim-Lim I who turned it into the most influential family in the Levant through both diplomatic and military tools. At its height the dynasty controlled most of northern Syria and the modern Turkish province of Hatay with a cadet branch ruling in the city of Alalakh.